Time for a reality check. The first time you sit in a silent room facing an SAT test shouldn’t be the morning of your test day. By that time, you should have at least one practice exam under your belt, fortifying you like a hearty breakfast for the rigors of SAT reasoning. Yes, working through a practice exam does kill a perfectly fine morning (or evening or middle of the night — whenever you prefer to practice), but the investment of time will pay off. I promise you that the tests in this part do prepare you nicely for whatever the SAT makers throw at you. Try one, score it, review whatever was tough for you (the answers and explanations follow each exam), and then, if you have time, try out another one. You may be bored now, but you’ll be smart and prepared come SAT day. The first paragraph is usually where you find my lame jokes, but in this chapter, you need to be as serious as you can be. Clear out your room or find a sheltered spot in the public library. Place a watch in front of you, or sit where you can see a wall clock. Tear out the answer sheet that follows this page and gather two lined sheets of loose-leaf paper and a No. 2 pencil. Allot yourself the official amount of time you have to take each section (I tell you how much time you get at the beginning of each section), and get to work. If you finish a section early, go back and recheck it. But don’t even think about looking at other sections. If you do so on the actual exam, the proctor will invalidate your whole test, and you’ll get a big fat zero for all your hard work! If you run out of time, put your pencil down and move on to the next section. Take a ten-minute break between Sections 3 and 4 and another ten minutes off between Sections 6 and 7. No matter how tempted you are, resist the urge to turn to Chapter 21, where the answers and explanations for this practice test reside. Save them for later! And good luck. 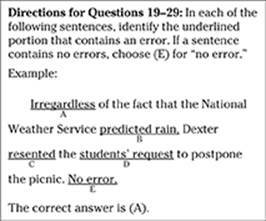 Note: The real SAT will have ten sections, instead of the nine you see here because the College Board throws in an “equating section” that doesn’t count toward your score but allows the testers to evaluate new questions. The SAT doesn’t tell you which section is useless (to you). Because I’m here to help you score high on the SAT, I don’t include an equating section in any of the practice tests in this book. Nice of me, huh? For Section 1, use two loose-leaf or lined notebook pages to write your essay. 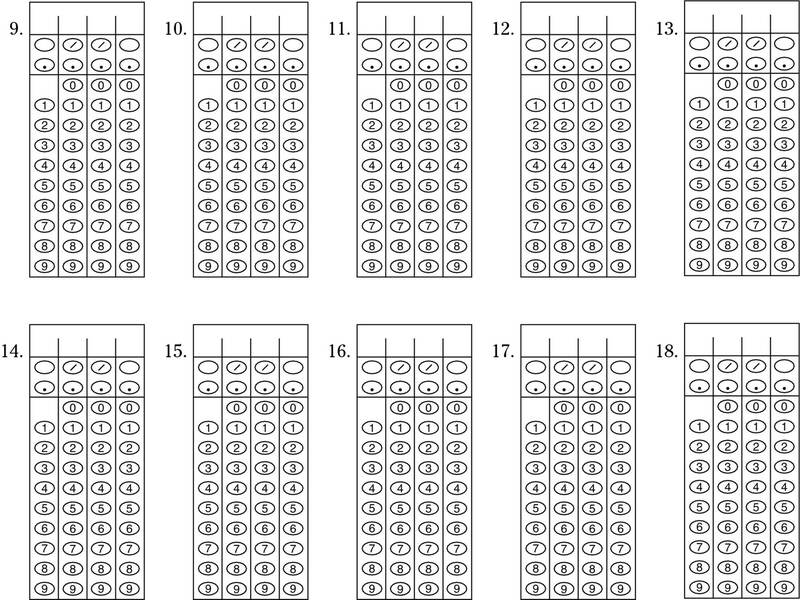 (On the real exam, the answer booklet contains two lined sheets.) For Sections 2 through 8, use the ovals and grid-ins provided with this practice exam to record your answers. Begin with Number 1 for each new section. If any sections have fewer than 35 questions, leave the extra spaces blank. Does curiosity help or harm? Discuss the role of curiosity in human life, drawing upon history, ­literature, current events, or your own experience and observations. 1. Helen’s response to the flood is not simply intellectual, but _____. 2. _____ research into the origins of Delkong culture indicates that a hunter-gatherer society was established about 2,000 years earlier than was previously thought. 3. It has been suggested that the _____ references to architectural history _____ the paper’s focus on engineering concepts. 4. Its presence in all languages has led many to the conclusion that grammar is _____. 5. By subsidizing small business, the government hopes to _____ the once prosperous area. 6. Although Deeplock has promised to shorten the agenda, the council is _____ about discussing the topic of global warming and will insist that it be included. 7. Notwithstanding the _____ effort on the part of the entire team, the championship went to the other division for the first time in ten years. 8. The revolt against Puritanism in the 18th century was perhaps more intense than the author’s _____ conveys. Directions for Questions 9–12: Choose the best answer to each question based on what is stated or implied in the passage or in the introductory material. Questions 9 and 10 are based on the following passage, excerpted from The Transformational Leader by Noel M. Tichy and Mary Anne Devanna (Wiley). 9. Which statement is implied in the passage? (A) There are many different ways to come to a decision in a large organization. 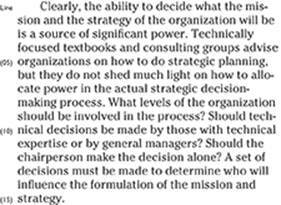 (B) The same person should not formulate both mission and strategy for an ­organization. (C) Powerful people are the only ones who should make a decision. (D) Textbooks that focus on technical matters are not useful. (E) All levels of an organization should be involved in decision making. Questions 11 and 12 are based on the following passage, excerpted from Physical Science in the Middle Ages by Edward Grant (Wiley). 12. What is the meaning of “trappings” in Line 6? Directions for Questions 13–25: Choose the best answer from among those given, based on what the author states or implies in the passage. 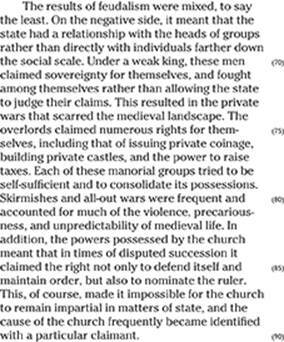 Questions 13 to 24 refer to the following passage, an excerpt from The Knight by Alan Baker (Wiley), which discusses feudalism. 16. 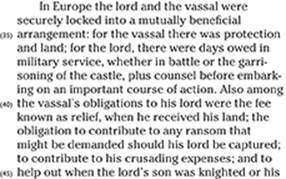 Based on this excerpt, what is the best definition of vassal? 17. Which idea is implied but not stated in the passage? 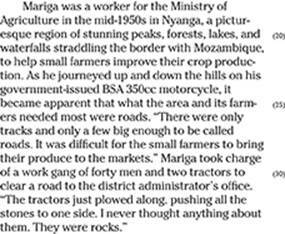 (A) Land was the basis of wealth in feudal society. (B) Knights were at war more often than not. 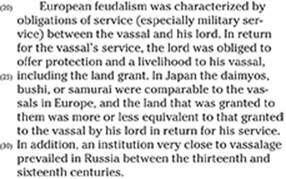 (C) Japanese daimyos were superior to European vassals. (D) Feudalism provided benefits only to the wealthy. (E) Marriage was a purely private decision. 20. The author of the passage would most likely agree with which statement? 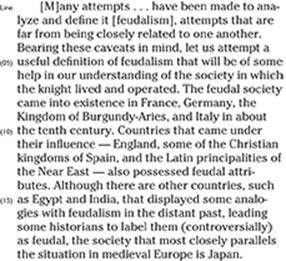 (A) Feudalism was directly responsible for the instability of the medieval period. 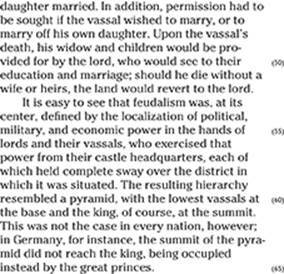 (B) Feudalism was weak in Germany because princes had too much power. (C) Feudalism worked best when religion played no role. (D) The feudal system did not work well in the absence of a strong king. (E) Feudalism protected the rights of women. 23. What is the closest meaning of “nominal” (Line 100)? 1. In a 28-student class, the ratio of boys to girls is 3:4. How many girls are there in the class? 3. In a drawer are seven pairs of white socks, nine pairs of black socks, and six pairs of brown socks. Getting dressed in a hurry, Josh pulls out a pair at a time and tosses them on the floor if they are not the color he wants. Looking for a brown pair, Josh pulls out and discards a white pair, a black pair, a black pair, and a white pair. What is the probability that on his next reach into the drawer he will pull out a brown pair of socks? 4. 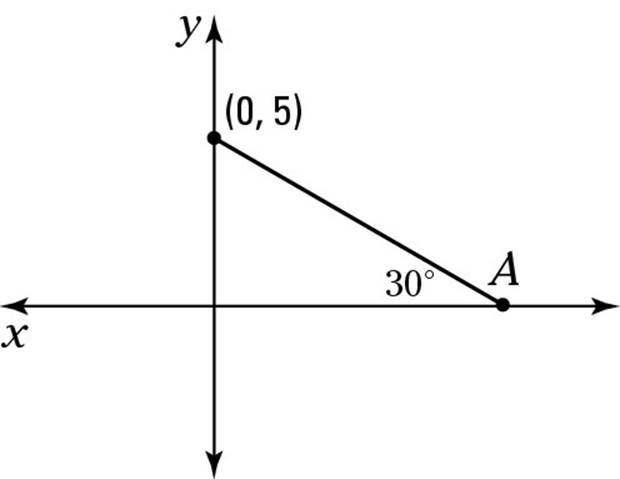 What are the coordinates of point A in the diagram above? 6. The ratio of Dora’s money to Lisa’s money is 7:5. If Dora has $24 more than Lisa, how much does Dora have? 7. 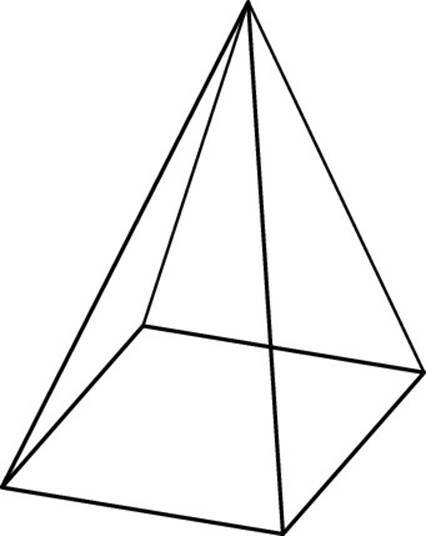 In a triangle, the second side is 3 cm longer than the first side. The length of the third side is 5 cm less than twice the length of the first side. If the perimeter is 34 cm, find the length, in centimeters, of the longest side. 8. On a number line, point A is at –4 and point B is at 8. What point is 1⁄4 of the way from A to B? 11. 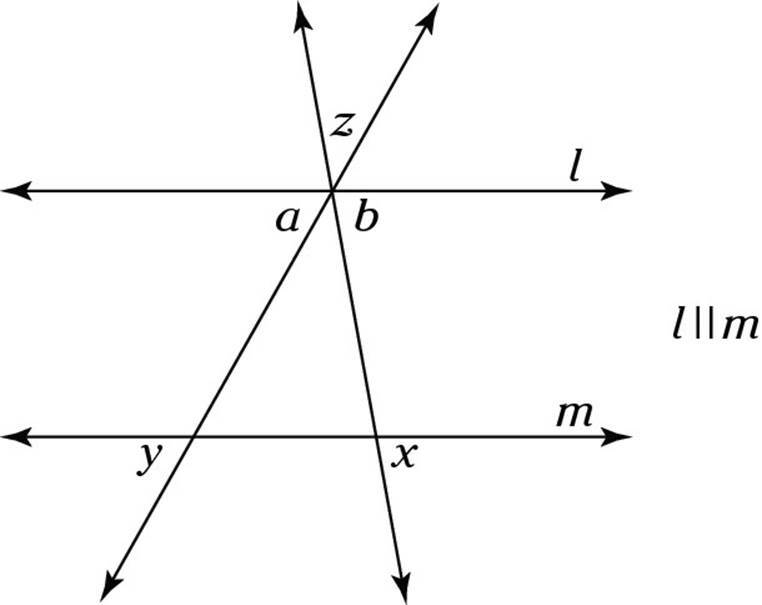 Let &x be defined as x + 3 if x is prime, and as 2x if x is composite. 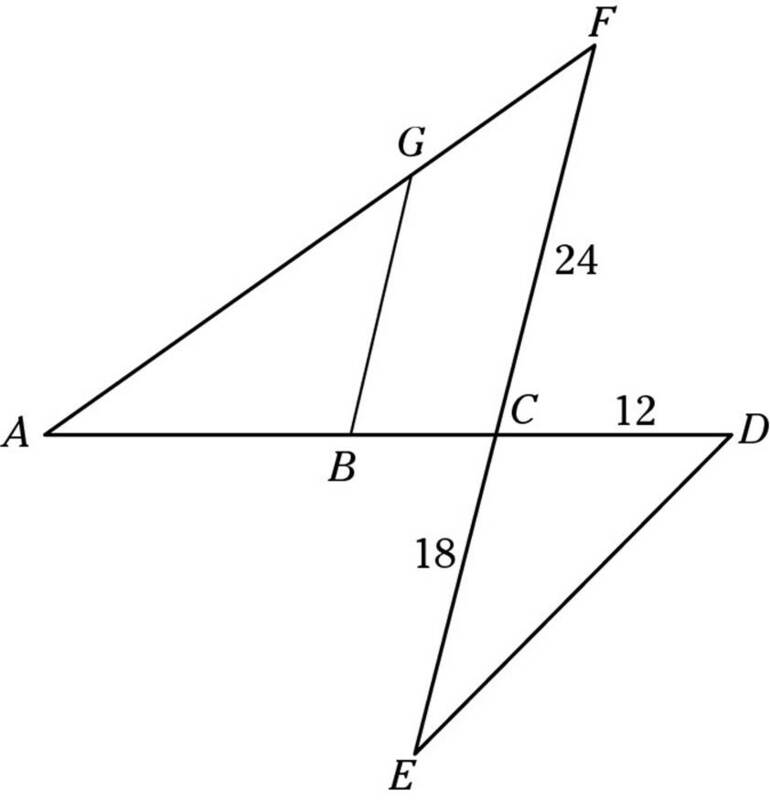 Which of the following would produce a result of 18? 13. If the data in the scatterplot above were approximated by a linear function, the line would come closest to which pair of points? 16. 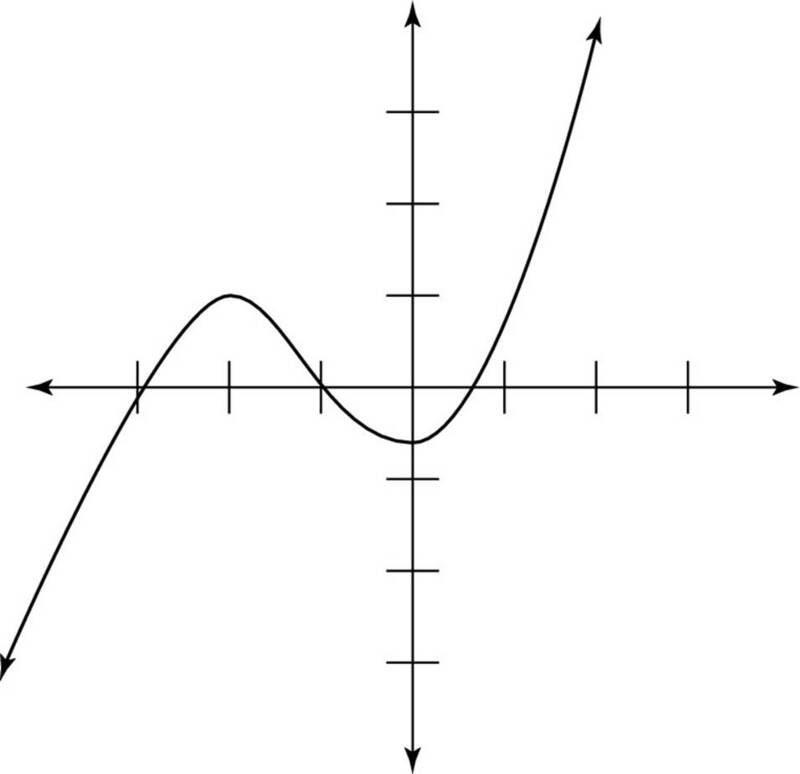 This graph represents a function, f(x). 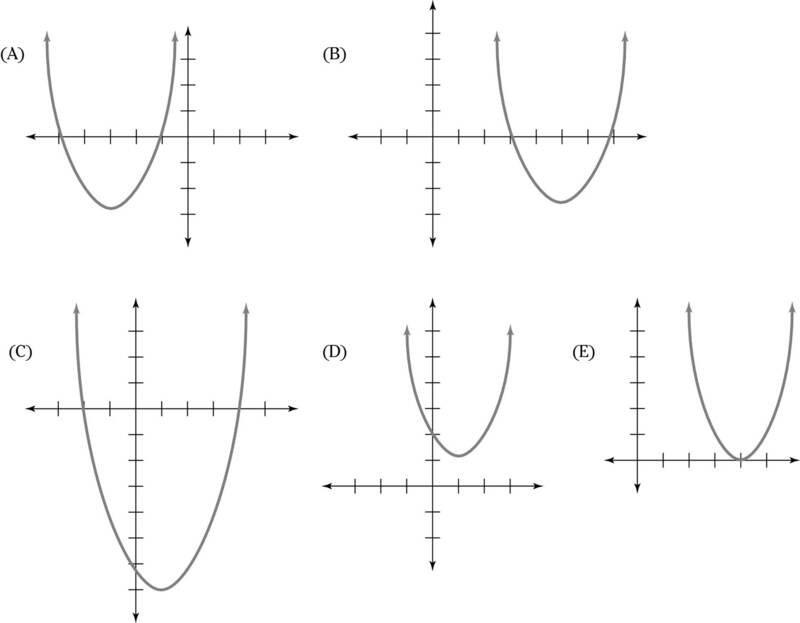 Which of the following graphs could represent f(x + 4)? 18. In a class of 100 students, 65 take Spanish, 32 take art, and 14 take both Spanish and art. How many students do not take either Spanish or art? 19. Max has 3 hours to study for his tests the next day. He decides to spend k percent of this time studying for math. Which of the following represents the number of minutes he will spend studying for math? 20. 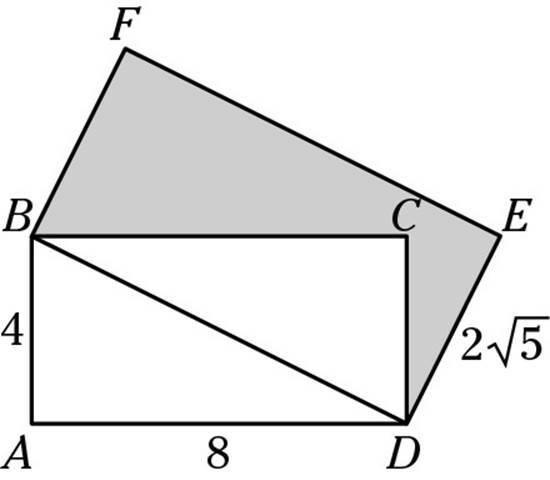 Given that ABCD and BDEF are rectangles, find the shaded area in this diagram. Example: Winning the prize, Harold was _____ in praising his competitors. 1. Elwood was admired by the citizens of the town who knew him, yet _____ by strangers who had merely read of his actions in the paper. 2. The ambassadors assumed an early end to hostilities, despite _____ from rebel groups. 3. The mayor’s statement that funds for police and firefighters should be _____ was belied by her insistence that taxes be _____. 4. The Supreme Court’s decision in Brown vs. Board of Education _____ legalized segregation, but more than a half century later, separate schools for black and white children _____. 5. Jane Austen wrote many of her novels in a small parlor in the family home in Chawton, relying on a squeaky door to _____ her when visitors approached so that she could hide her manuscript and thus _____ her work. 6. Although the opposing factions were not able to achieve _____, they left the jury room in _____. 7. After studying cancer for many decades, scientists have come to the conclusion that cancer is not one disease but rather a(n) _____ of conditions with _____ symptoms, ranging from solid tumors to an unchecked proliferation of white blood cells. 8. When she won the lottery, her friends expected Eleanor to be _____, but she was surprisingly _____. 9. The display of religious artifacts in that store is quite _____, including pieces from many periods and nations. Directions for Questions 10–24: Base your answers on information in either or both of the following passages. You may also answer questions on what is implied in the passages or about the relationship between the two passages. Passages I and II are drawn from Into the House of Ancestors: Inside the New Africa by Karl Maier (Wiley). 10. What is the primary purpose of the first paragraph (Lines 1–17) of Passage I? 20. In the context of Passage II, which best describes the meaning of “tiger” (Line 82)? 21. Which statement would the author be most likely to add to Passage II? (A) Foreign nations should establish schools in Africa. (B) Communities and private individuals must support education. (C) Educational reform is dependent upon good government policy. 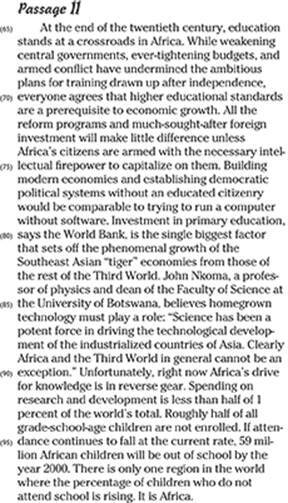 (D) Africa should hire teachers from Southeast Asia. (E) Taxes to support education must be increased. 24. Which statement best compares the two passages? (A) Passage II is more general than Passage I. (B) Passage I is less descriptive than Passage II. (C) Passage I takes a less personal viewpoint than Passage II. 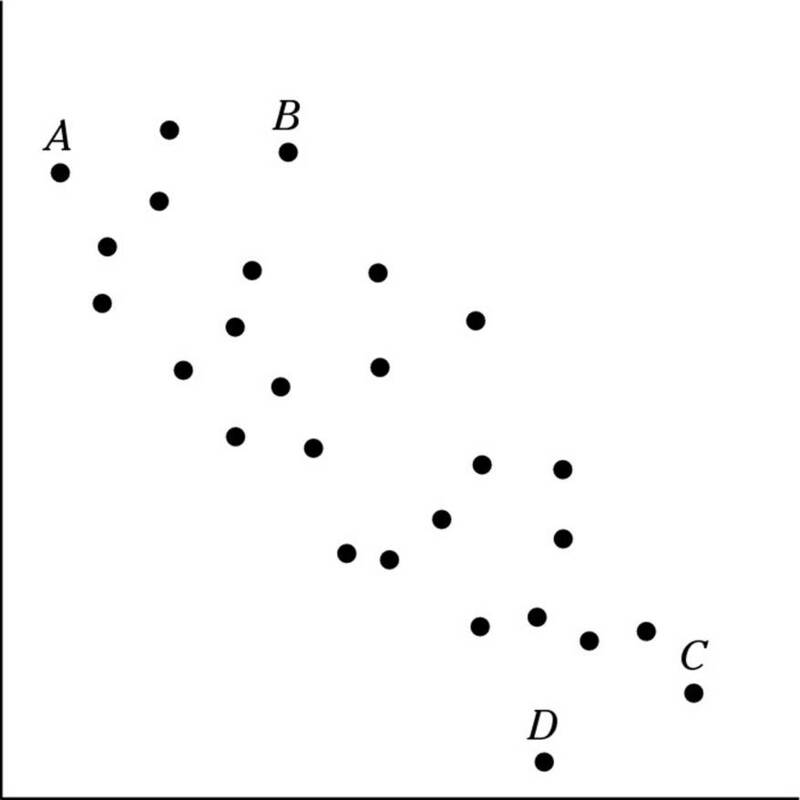 (D) Passage II illustrates the points made in Passage I. 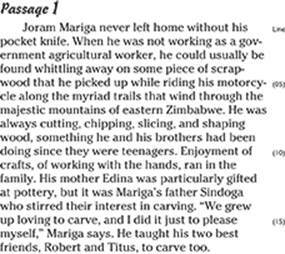 (E) Both passages use narrative to make a point. 2. In a certain game, there are only two ways to score points; one way is worth 3 points, and the other is worth 5 points. If Tamsin’s total score is 61, which of the following could be the number of 3-point scores that Tamsin had? 3. A number, n, is defined as a “tweener” if both n – 1 and n + 1 are prime. Which of the following numbers is a tweener? 4. If the square of x is 12 less than the product of x and 5, which of the following expressions could be used to solve for x? 5. A batch of mixed nuts was created by adding 5 pounds of peanuts, costing $5.50 per pound, to 2 pounds of cashews, costing $12.50 per pound. What would be the cost, per pound, of the resulting mixture? 8. A square is changed into a rectangle by adding 3 meters to one side and subtracting 2 meters from the other side. The new rectangle has an area of 50 square meters. 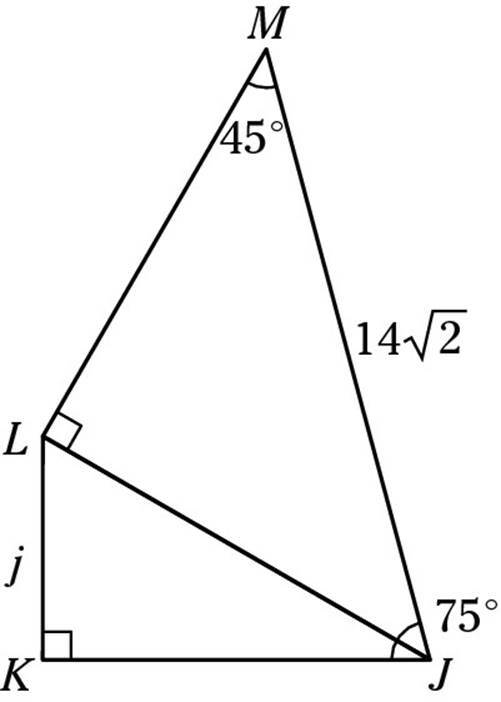 Find the original length of a side of the square. Directions for student-produced response Questions 9–18: Solve the problem and then write your answer in the boxes on the answer sheet. Then mark the ovals corresponding to your answer, as shown in the following example. Note the fraction line and the decimal points. 9. Lauren took four exams. Her scores on the first three are 89, 85, and 90. If her average (arithmetic mean) on all four exams is 90, what did she get on the fourth exam? 10. In a school survey, 40% of all students chose history as their favorite subject; 25% chose English; and 14 chose some other subject as their favorite. How many students were surveyed? 11. 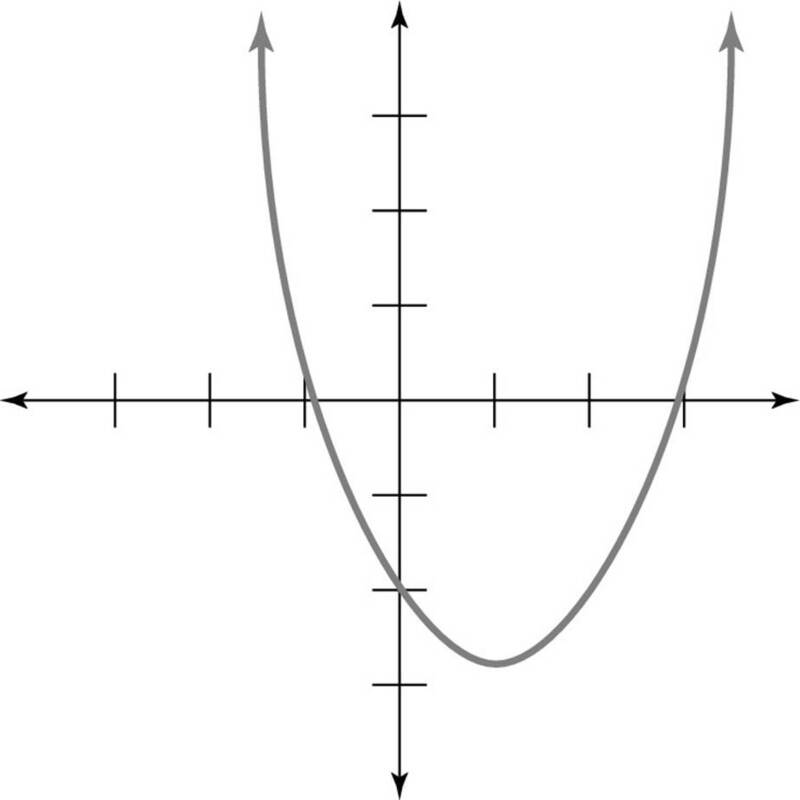 Find the value of x that satisfies . 12. For all numbers p and q, where p ≠ 4, let p\\q be defined as . For what value of p does p\\7 = 21? 13. The ratio of a rectangle’s width to its length is 2:5. If its perimeter is 84 feet, find its width, in feet. 14. Renting a private party room in a restaurant can be modeled as a linear function. If the cost of a party of 8 is $270, and the cost of a party of 10 is $320, find the cost, in dollars, of a party of 18. 15. Darren receives $9 an hour for his afterschool job, but gets paid 11⁄2 times this salary for each hour he works on a weekend. If he worked 18 hours one week and received $189, how many of these hours did he work on weekends? 16. If p > 0, and the distance between the points (4, –1) and (–2, p) is 10, find p.
18. The pyramid above has a square base of length 10 cm and a height of 12 cm. Determine the total surface area of all five faces, in square centimeters. Directions for Questions 1–18: Each sentence is followed by five choices. Choose the answer that best improves the sentence. If the underlined portion of the sentence is best left alone, choose (A). 1. Jenny finds that she has time only for playing sports and studying, not to audition for the school musical as well. 2. Yesterday the weather forecaster noted a sharp fall in barometric pressure, this is an indication that a storm is coming. 3. The lion had a thorn in it’s paw, but the zookeeper was able to take care of the problem. 4. The Native American guides objected to him trespassing on sacred ground. 5. Just between you and I, the school board would like to place less emphasis on standardized tests. 6. At present, Max’s family traveled to California eight years in a row. 7. Impatiently waiting at the curb, the taxi sped past the toddler who was holding his mama’s hand. (A) Impatiently waiting at the curb, the taxi sped past the toddler who was holding his mama’s hand. (B) The taxi sped past the toddler who was holding his mama’s hand impatiently waiting at the curb. (C) Impatiently waiting at the curb, the toddler watched the taxi speed past, holding his mama’s hand. (D) The toddler impatiently waiting at the curb held his mama’s hand and watched the taxi speed past. (E) The toddler impatiently waiting at the curb held his mama’s hand, and watched the taxi speed past. 8. Duke’s rubber bone is one of those adorable dog toys that are sold in every petshop. (A) toys that are sold in every petshop. (B) toys which are sold in every petshop. (C) toys that is sold in every petshop. (D) toys, that is sold in every petshop. (E) toys, that are sold in every petshop. 9. The reason protestors object to the biology curriculum is because they believe that students should not dissect a frog. 10. Tim can’t understand why Olivia doesn’t write as well as him. 11. The executive chef prepared the delicious and nutritious casserole, however his assistant deserved all the credit for developing the recipe. 12. Deborah gave a piece of birthday cake to whomever she thought would eat it. 13. The gas station stood where the supermarket was. 14. Neither the teacher nor the students was willing to forgo the class trip and substitute a virtual tour of the museum. 15. In the newspaper it says that the state colleges are considering a tuition increase to meet rising costs. 16. The results of that scientific study are considered suspect because of possible bias on the part of the researchers, who were funded by a pharmaceutical company. 17. The Czech Republic and Slovakia were once united as “Czechoslovakia,” and the groups had two different languages and traditions. 18. The faulty part may cause the stroller to collapse, and this is why the company has recalled the product. 30. In the context of this essay, which of the following is the best revision of Sentences 1 and 2? (B) These days it is possible to watch trials on television, and several important trials have been televised for months on end, while a whole TV network shows nothing else. (C) These days it is possible to watch an actual, live trial on television, sometimes for months. In fact, an entire television network shows nothing but trials. (D) The Justice Network broadcasts nothing but trials, some of which last for months. These trials are not fiction. Viewers see live court proceedings with real defendants. (E) One television network shows trials, all day, every day. These trials are real, and some last for months. 31. What is the purpose of Paragraph 2? 32. How may Sentences 6 and 7 best be combined? 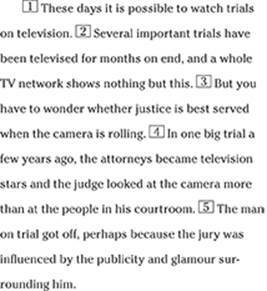 (A) True, the jury cannot see the broadcast, they often must stay in hotels during important trials. (B) True, the jury, that must often stay in hotels during important trials, cannot see the broadcast. 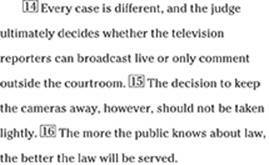 (C) True, the jury cannot see the broadcast, due to the fact that they often must stay in hotels during important trials. 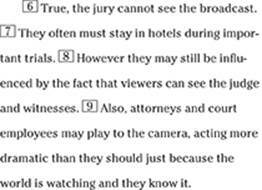 (D) True, the jury cannot see the broadcast because of the fact that they often must stay in hotels during important trials. (E) True, the jury, which must often stay in hotels overnight during important trials, cannot see the broadcast. 33. Which of the following is the best revision of Sentence 9? (B) Also, attorneys and court employees may behave more dramatically than they should just because they know that the camera allows the world to watch. (C) Also, attorneys and court employees may play to the camera, acting more dramatic than they should just because the world is watching and they know they are on television. (D) Also, attorneys and court employees may play to the camera, acting more dramatic because the world is watching. (E) Also, attorneys and court employees may play to the camera, acting more dramatic than they should just because the world is watching through the camera. 34. How should Sentence 10 be changed? 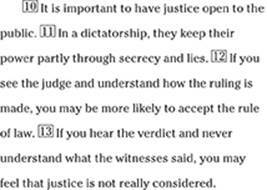 (B) Most important is the fact that justice should be open to public view. (C) On the other hand, justice should be open to the public. (D) Despite what you may say, it is important to have justice open to the public. (E) It is important if justice is open to the public. 35. What is the purpose of the last paragraph? 1. The study of identical twins reared separately has provided evidence that one’s genetic makeup is a powerful but not _____ force. 2. To reduce _____, the company will no longer mail monthly paper statements to those with _____ to online statements. 3. The _____ author churned out at least one book a year. 4. With interest but without _____, the baby examined the new toy from every angle. 5. The crew quarters on the submarine were so _____ that each sailor was _____ only a tiny locker. 6. Glazing his pottery in _____ colors, the artist’s display resembled a rainbow. Directions for Questions 7–10: Choose the best answer from the information supplied or implied by the passages. 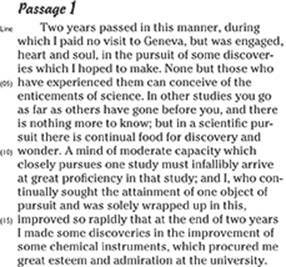 Passage I is drawn from Mary Shelley’s famous novel, Frankenstein. 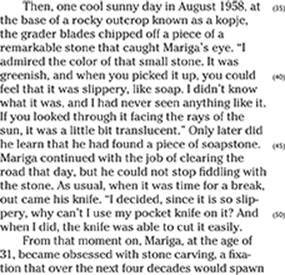 In this excerpt, the narrator describes his scientific studies. 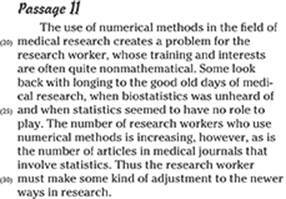 Passage II comes from Basic Statistics: A Primer for the Biomedical Sciences by Olive Jean Dunn (Wiley) and discusses the role of statistics in medical research. 9. The author of Passage II would agree with which of the following statements? (A) Medicine in times past was more technological than statistical. (B) Medical researchers should take a course in statistics. (C) Mathematics has no place in medical training. (D) The inclusion of statistics makes publication of medical research less likely. (E) Old-fashioned doctors were better equipped to treat patients. Directions for Questions 11–19: Choose the best answer to each question, based on the information in the passage. 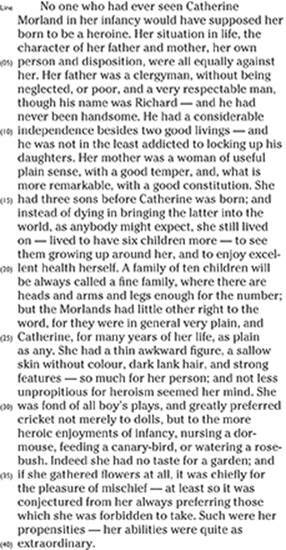 This passage is excerpted from Jane Austen’s novel, Northanger Abbey. Note: A “living” is an appointment to the post of minister in a particular area. A “living” carries a salary. 12. What does the author imply about men named Richard (Line 8)? (A) They are usually not respectable. (B) They are inclined to spiritual pursuits. (C) They are seldom rich. (D) They suffer from neglect. (E) They can be trusted completely. 13. 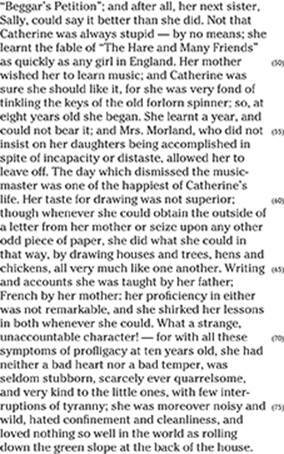 What, according to the passage, is the most surprising fact about Mrs. Morland? 14. What phrase best defines “good constitution” (Line 14)? 17. What best defines “bear” (Line 55) in the context of this passage? 19. One can infer from the passage that which of the following subjects was part of the normal instruction of a young girl of Catherine’s time? 1. If an eight-slice pizza has a diameter of 12 inches, what is the area of one slice, in square inches? 3. A certain radioactive element has a half-life of 20 years. Thus, a sample of 100 grams deposited in 1980 would have decayed to 50 grams by 2000 and to 25 grams by 2020. How much of this sample would remain in 2100? 4. Set S contains the numbers 20 to 40, inclusive. If a number is chosen at random from S, what is the probability that this number is even? I. It has three digits. II. Its units digit is the sum of its tens digit and its hundreds digit. III. It is a perfect square. Which number could be n? 6. 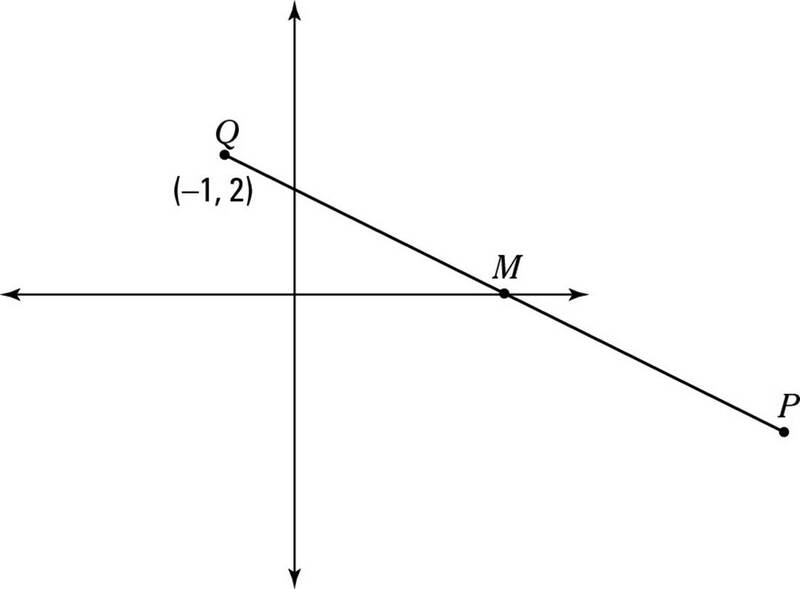 In this figure, the slope of line PQ is –1⁄3, and M is the midpoint of the line PQ. What are the coordinates of point P? 7. If ab = n, b + c = x, and n ≠ 0, which of the following must equal n? 8. The number g is divisible by 3, but not by 9. Which of the following is a possible remainder when 7g is divided by 9? 9. If a > 0, which of the following statements must be true? 12. A bicycle has a front wheel radius of 18 inches. If the bicycle wheel travels 50 revolutions, approximately how many feet has the bicycle rolled? 14. In a set of five positive whole numbers, the mode is 90 and the average (arithmetic mean) is 80. Which of the following statements is false? (A) The number 90 must appear two, three, or four times in the set. (B) The number 240 cannot appear in the set. (C) The number 80 must appear exactly once in the set. (D) The five numbers must have a sum of 400. (E) The median cannot be greater than 90. 15. 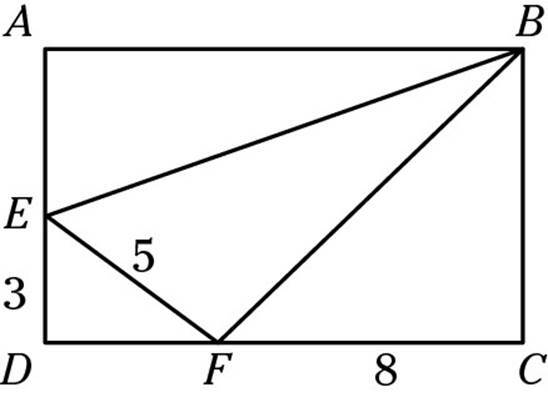 Given that ABCD is a rectangle, and triangle BCF is isosceles, find the length of the line segment BE in this diagram. I. Mike and Melvin refuse to live together. II. Enoch will live with Chris or Carey (or possibly both). III. If Dave and Dan live together, Peter will live with them. When rooms are chosen, Melvin, Carey, and Dan live together. Which of the following groups must live in the other room? 1. The movement of refugees into centralized locations facilitates the delivery of essential services, in order that the refugees should survive until the crisis is over. 2. Mr. Berens reported that his parking permit was displayed on the front windshield, although the traffic officer claimed otherwise on the ticket. 3. For centuries, historians have been debating the role of Cleopatra, and the claim that she was as powerful as any Roman ruler is controversial. 4. Having seen his father’s law practice, Joseph was determined to become one himself someday. 5. The French artist Manet identifying with the realism of his predecessors, which in turn grew out of Romanticism. 6. For the majority of banks receiving funds from the government in the current economic downturn, salary caps were requirements and they didn’t like them. 7. The ceramics teacher giving his students five possible glazes, there is at least one that suits each vase. 8. Viruses, when entered in the body, activate the immune system. 9. Given the high rate of accidents, the superintendent objects to our organizing a rock-climbing club. 10. After having been told by their leaders that the war would be short and then subsequently disappointed, the citizens rebelled toward the government. 11. In the tradition of her ancestors, who carved intricate designs on their houses, Ella will decorate for hours at a time. 12. Sent to boarding school at an early age, the curriculum was hard for Sandra. 13. George Washington inspired his soldiers by his heroism and that he was always motivated by patriotism. 14. The literary works of ancient Greece are equally as interesting as those of ancient Rome.